I came up with an interesting way to split my code base that I think can apply to a wide range of projects. Nodes are sometimes down or overloaded and time out. So the API access is not stable. In short, there are many things that can go wrong and crash my whole application. I then came up with the following idea: Similar to micro-services, I’ll just create several, what I call micro-processes, that have only one strictly defined task. A micro-process is simply a tiny node app itself. Why is it helpful? The idea here is better fault isolation - if one micro-process fails, the others continue to work. It also comes with the added benefit of a better separation of concerns. Each micro-process is responsible for only one job, which itself leads to code that is easier to understand and maintain. It allows other open-source members to be productive right away without needing to know the whole application stack. If done incorrectly, the code structure can become more complicated, because everything is now spread out possibly over several repos / NPM modules. In the worst case, fixing a simple bug might then lead to having to touch and release several packages. We will avoid this by using lerna, a a tool that optimizes the workflow around managing multi-package repositories with git and npm. It should still be easy to manage all the micro-services. In the worst case, we have to update and maintain all build tools on an individual micro-process level. Again lerna helps us here for managing the dependencies and building the micro-processes, as we’ll see later. We’ll also make use of PM2, a process manager for Node apps that can start several processes at once, and automatically restart them when one crashes. How do we pass and receive data between the micro-processes? In a monolithic app, we can just call functions, callbacks, and promises to pass and receive data. For our micro-process architecture, we will use Interprocess Communication (IPC). We’ll use the great node-ipc library for local communication between our micro-processes. The solution to many of these challenges is (ab-)using lerna. Lerna is a tool for managing multiple packages in a single git repository. The task it tries to solve is to make publishing interdependent packages easy. It’s often used in UI libraries having a lot of custom components that might depend on each other. While we don’t intend to publish our individual micro-processes to npm, abusing lerna and making each micro-process an individual package still gives us the benefit of bootstrapping all packages: It installs all their dependencies, sym-links the packages that depend on each other, and runs custom scripts for each package. This will create a lerna.json file, which you can ignore for now, and create a packages folder where our micro-processes will live. 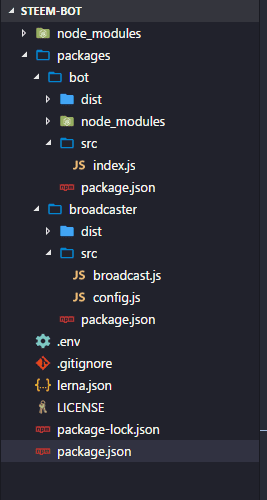 The repo has a global package.json file and each individual package in packages is just another NPM app with its own package.json file. broadcaster: This package will listen to the steem blockchain and internally broadcast all transactions, comments, votes to the other micro-processes. bot: The bot itself, which listens to the data from the broadcaster, checks if the data is relevant to it and then does its bot logic. I’m using ES6/ES7 features, so I need to transpile it with babel, that what the build script is for. I also do the build step in a prepublish script, because lerna executes all prepublish scripts while bootstrapping. start scripts that run the micro-process. Note that we’re using private NPM repositories here (indicated by the @name/ before the app name). I never intend to publish these packages to NPM, I just misuse it as a namespace, to keep all my lerna packages for a specific app under the same name. We create the bot micro-process the same way, with the same scripts. Note how we added the broadcaster as a dependency to the bot. We can use this to share the broadcaster’s config to all micro-processes using it. Now, here’s the great things: When we run lerna bootstrap --hoist, lerna will install all dependencies for the packages, run our prepublish scripts which builds the sources, and sym-link the broadcaster, such that it is just another external dependency for bot. The --hoist flag installs common dependencies of all packages (like dotenv, node-ipc, steem) only once in the lerna root folder’s node_modules. So the dependency is only installed once for the whole app, instead of once for each package. You can check out the code structure on GitHub. We already added node-ipc as a dependency to our packages. It uses local UNIX / Windows sockets for inter-process communication (IPC). There’s one or several servers, and clients that connect to them. Messages can then be broadcasted from a server to all connected clients, or to clients on an individual basis. In our case, the broadcaster acts as the server to which the bot is connected. We use ipc.server.broadcast(type, data) to broadcast the Steem data by their type, i.e., connected clients can choose to listen only to certain types like comment or vote. Starting all the micro-processes by hand is tedious, so we use a node process manager. I like PM2 because of its simplicity and nice features: You can define which npm scripts to run on which packages in a config file, and it automatically restarts crashed processes. I created a GitHub repo with this boilerplate.